PanARMENIAN.Net - Next year, on August 31, American-Armenian novelist and playwright William Saroyan will be back in Fresno for his 110th birthday, walking around in his house, talking to visitors, and even making jokes. This is not an illusion, but a real and ongoing project crafted by the Intellectual Renaissance Foundation (IRF), Fresno Bee reports. “The interactive museum will erase all boundaries of time and space,” Satenik Avagian, who works on this project from Armenia, stated. IRF is working with Storaket (“Comma” in Armenian) Architectural Studio on developing the concept and design, transforming William Saroyan’s home into a museum with a three-dimensional mapping of him. According to the creative team of Armenian designers the visitors will be able to hear Saroyan’s voice. “Saroyan won’t merely talk to them but will be able to communicate, answer their questions,” Storaket’s representative responded to the communication. In addition, characters from Saroyan’s stories will also be set in 3D and interacting with visitors. “When we first presented the challenging idea of 3D mapping to Artur Janibekyan, the chairman of IR Foundation, we weren’t sure how he would react. The project seemed to be almost a crazy one. But not only he accepted it, but pushed to make it even more creative,” co-founder of Storaket, Meruzhan Minasyan, added. IRF has also conducted extensive research to find documentation and archives on Saroyan and his life, which is mainly kept at Stanford University, the San Francisco-based William Saroyan Foundation, and family and friends of the author. 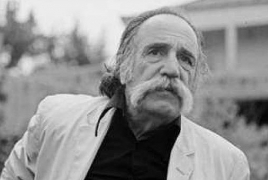 The photo images reflecting William Saroyan's trips to Armenia will also be exhibited in Yerevan, the capital of his ancestor’s homeland, later this year. “William Saroyan traveled to Armenia four times. We were able to collect hundreds of images reflecting all his trips,” Avag Simonian, the chair of the Armenia branch of IRF said.